Ships from and sold by Carthage Merchandise. I read in the reviews that the bottom was higher in the middle than on the sides, but I figured I can handle that. Turns out, the middle is really, really, higher. Unless you want 1/2 inch of oil on the side to cover the middle just a little bit, the middle will always be dry. 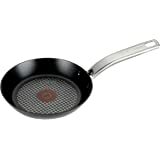 The non-stick is great, but be prepared to fry on the side and dry-roast in the middle. 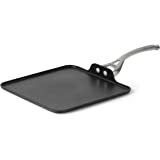 Great nonstick saute/fry pan to cook large quantities at once...it holds 5 quarts. You can use none or practically no oils, butter etc. 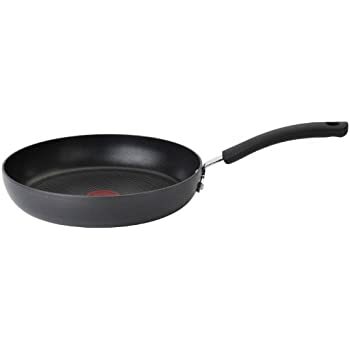 when using this pan after prepping it initially w/ some oil via a paper towel. 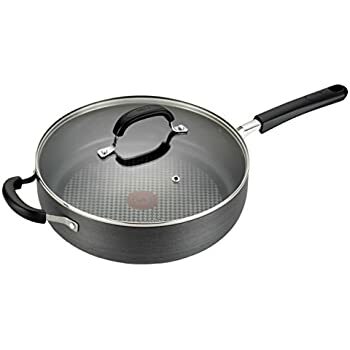 The red thermo-spot in the middle of the pan tells you when it is hot enough to saute or fry something. No problems w/ foods sticking. 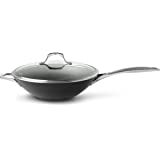 The lid is helpful when you are cooking and/or keeping foods warm in the pan. 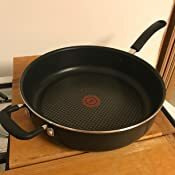 You can put this pan in the oven up to 350 degrees. 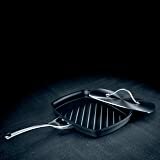 The two silicone padded handles make this pan easy to maneuver when cooking and/or carrying it to the serving area without burning yourself. Washing it is a breeze with just some soap & water. 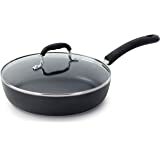 I have not washed it in the dishwasher as I have found in the past w/ nonstick items...it wears off the nonstick surface much quicker thus shortening the length of the usage of the pan. 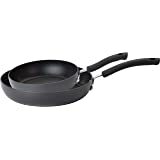 I was deciding whether to buy one of the really expensive brands of saute/fry pans in this size but opted for the less expensive brand as the quality appears very similar. 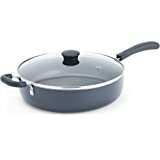 Also others commented that they had bought the more expensive brands in the past and found they worked no better and/or lasted longer and they were also happy with this purchase. 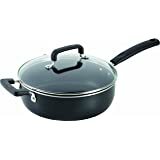 I am glad I took their advice...I love this pan! I love the fact it is lightweight. 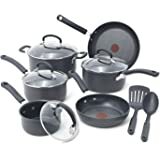 So many other pans are so heavy before you start to cook I can hardly lift them. 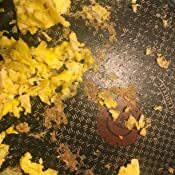 This cleans fast, easy, and you can place it in the dishwasher as well without warping or changing colors. 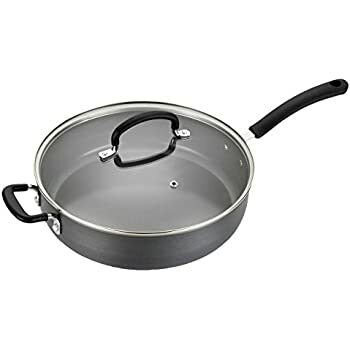 The best part is it works on induction tops as that is a difficult thing to find without a heavyweight pan. I took away a star only because the bottom is not completely flat on the inside. It is a slight bit higher in the middle to allow drainage to the outside. I did not like this feature. In many applications, it might be nice, yet I prefer a completely flat pan on the inside. 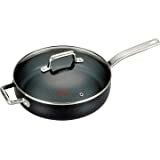 Price is reasonable for an induction pan as induction cookware is expensive. It can go in the oven too but it states per the manufacture the lid is 500 degrees tolerable, but the pan is 350 degrees tolerable. Did not make sense to me they would not do them both at the same tolerance of heat. For the price, I am very satisfied with it. 5.0 out of 5 starsGreat purchase! 3.0 out of 5 starsCooks great but exterior finish has serious issues! I have the 10-inch version of this pan and LOVE it. 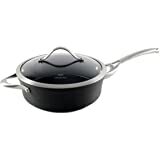 Cooks great on my gas stove, truly has been safe running through the dishwasher, great pan all around, so I ordered this 5-quart size, as we need a larger pan for most of our cooking needs. Pan has worked great for a weeks, when all of a sudden, the outer finish WASHED OFF today when I was HAND WASHING in the sink. 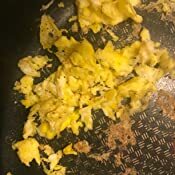 To note, I have not changed a single thing about my cooking and cleaning routine; I have been using the same utensils, dish soap, and dishwasher packs for years, so this baffled me how the finish could wash off with a mild dish soap. 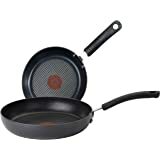 I am returning for a replacement, but for some reason, the pan is now on backorder for 1-3 months?!?!? Buyer beware! 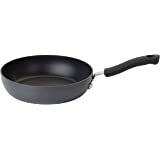 I have this exact pan but an older model with a silicone handle on plastic support handle. The center chipped and bare aluminum started showing so I bought this as a replacement. 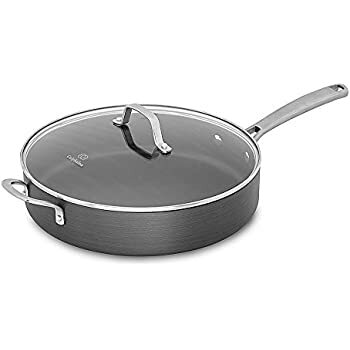 I love the look with the stainless steel style handles and I am so happy they finally have a model where the handle isn't screwed in. 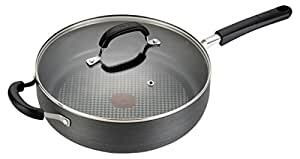 Every single T-fal pan I own has a wobbly handle that I need to keep tightening because they screw the plastic handle onto a riveted mount. 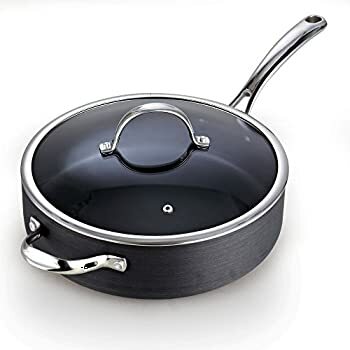 I docked one star because I'm almost positive that this handle is going to bend if I don't use the support handle when lifting a heavy pan of food. I don't think I should need to use the support handle but since they decided to use a hollow handle (I will never understand why someone would want a hollow handle) it's probably going to bend if I don't use it. I'm not a fan of hollow handles because I have a gas burner, all that heat that goes up the side of the pan goes right through hollow handles making them too hot to touch. It's like a chimney for hot air. If you just close off the bottom or don't use a hollow handle this wouldn't be a problem. A solid handle would also fix the issue of possibly bending the handle as well. 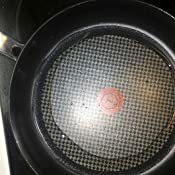 My son has an induction stove and needed a deep pan with lid, nonstick and worked on an induction stove. This was it. 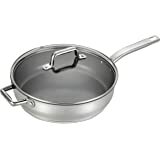 Being a 5 quart pan having that lifting handle on one side is perfect. The coating appears to be well made and the lid is heavy with stainless steel edging. 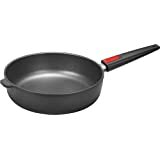 I would recommend this for anyone needing a large skillet that nonstick. Bonus: Induction stove friendly.